When my son was in preschool, I'd help him make heart shaped Valentine cards for his classmates using two candy canes. 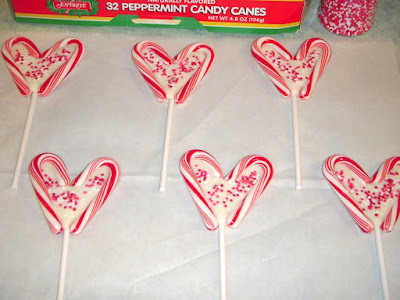 You can take the idea a step further and put the candy canes on a lollipop stick, use melted chocolate to hold everything together and decorate it with Valentine sprinkles. Start by putting two mini candy canes together in a heart shape on a piece of parchment paper. Leave enough space at the bottom of the candy canes to insert a lollipop stick. room for the lollipop sticks. Center the lollipop stick at the top of the candy canes where the two pieces meet. Once the stick is centered on the top, slide the bottom of the candy canes over until they touch the lollipop stick. Normally when I melt chocolate, I use a 1 1/2-quart crock-pot so I don't have to keep remelting the chocolate. However, I'm usually coating cookies or chocolate covered cherries or making candy molds, all of which are more time consuming. Filling the candy cane hearts with melted chocolate is quick so I use the microwave to melt the chocolate. Spoon the chocolate into the heart shaped opening -- I fill one side at a time -- being careful not to overfill. If any chocolate gets on the candy canes, gently wipe it off with a paper towel. Let the chocolate set a minute or two and then decorate the top with Valentine sprinkles. Let the lollipops dry completely on the parchment paper. Once they're dry, put them in lollipop treat bags and tie the bags closed with ribbon or, what I like to use, raffia. Candy canes are the essential ingredient for this recipe. If you don't have any, keep the idea in mind for next year. I'll even post a reminder blog in December so you can stock up on candy canes. If you're lucky enough to have some candy canes on hand, the recipe is quick and easy to make and, unlike a card, is edible. Put the candy canes in a heart shape on parchment paper. Insert a lollipop stick, making sure to slide the bottom part of the candy canes over so they touch the stick. Melt the chocolate chips and oil in a microwave until melted, stirring at 15 second intervals. Spoon the chocolate mixture into the heart shape opening and decorate the top with sprinkles. Let dry completely. Place each lollipop into a lollipop size treat bag and tie closed with ribbon or raffia. Thanks! The white chocolate and peppermint are a wonderful combination. 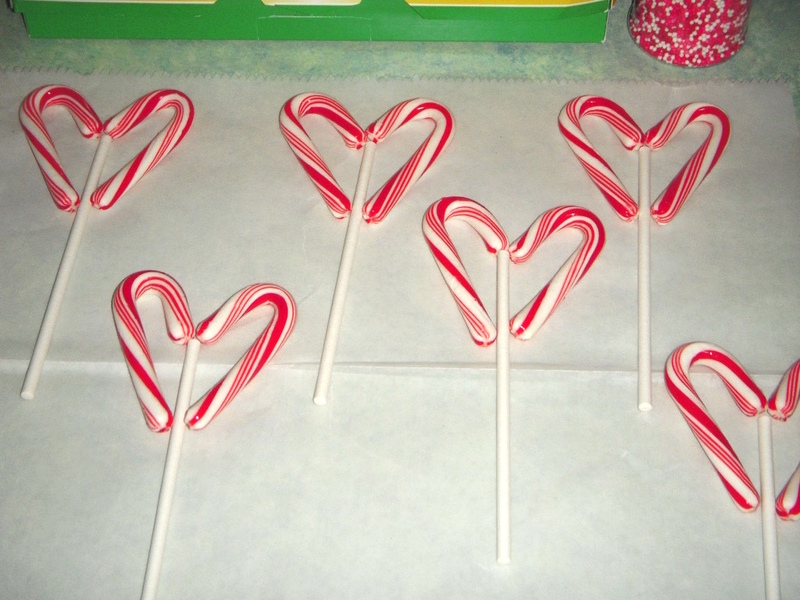 These are cute and a great way to use candy canes left over from Christmas! Thanks, Shelby! I've never been a fan of white chocolate, but I love it paired with the peppermint in the candy canes. Thank you for linking up at Tasty Tuesdays! Your post has been pinned to my Recipes from Tasty Tuesday board. I can't wait to see what you link up next week! This is so cute! I wish my daughter was still young enough for these. Thanks for linking to the In and Out of the Kitchen Link Party. Hope to see you next week. I'm in the same boat; my son is 16. These are great for a church candy sale close to Valentine's Day:) I hope to be at your party every week. Thanks, Renee! I've got another Valentine's Day idea I'm hoping to share if I can get it together. Thanks for writing. 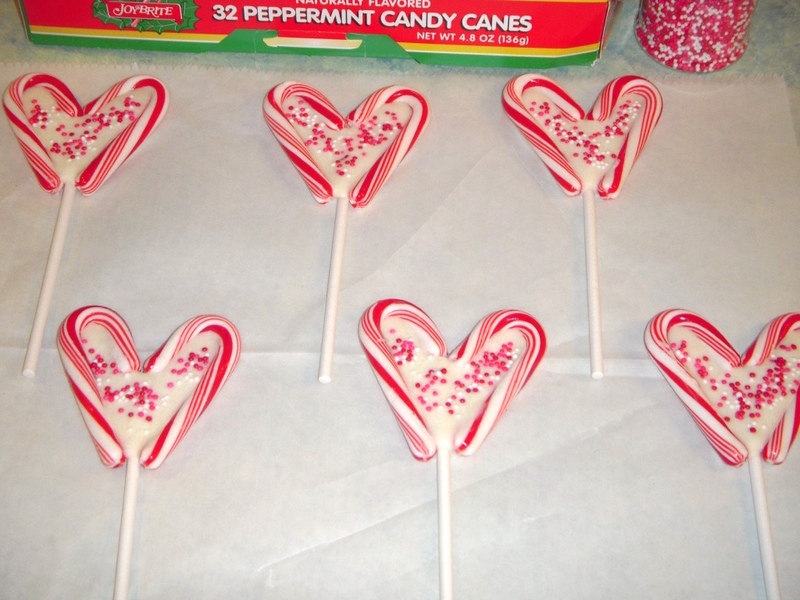 These valentine's day lollipops are such a great idea! TFS this at Cooking and Crafting with J & J. What a great idea. I love the way you filled in the hearts. Pin ed and shared. Thanks for linking up at #ThursdayFavoriteThings! I hope to see you also at #OverTheMoon. Thanks, Marilyn! Thanks for hosting the party so I could share this post. See you soon! Thanks, Jess! I hope you have a good week. What a great way to use candy canes left over from Christmas! Thanks for lending your creativity to the Thursday Favorite Things Blog Hop! I also pinned this to the Thursday Favorite Things Pinterest Board. Thanks, Shellie! Thanks for hosting the blog hop. I know they are a lot of work! Thank You, Merci, Danke, Grazi, Gracias!!! !